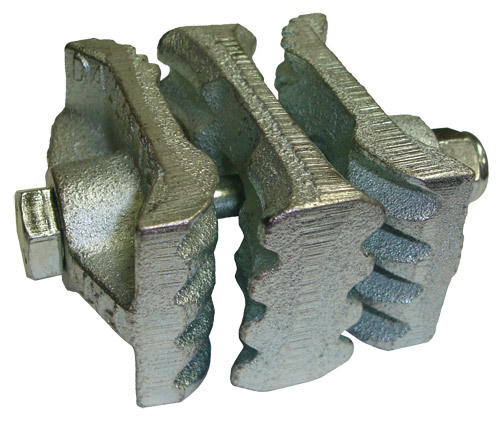 4B Vise Splices are mechanical splices and fasteners for use on most PVC and rubber elevator belts. Each splice unit is made of three pieces. The outside plates have two different gripping areas. The ribbed gripping area is mounted towards the face of the belt. The opposite end has a series of both longitudinal and axial "teeth." The center plate is symmetrical and cannot be improperly installed around its elongated center hole. 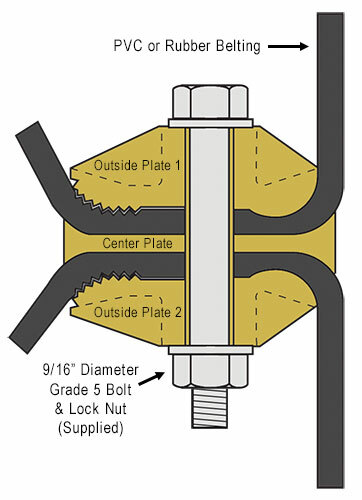 The splice functions by using the tension supplied by the belting. This tension on the belt ends pulls the outer plates apart, and forces gripping pressure towards the teeth on the splice unit. The greater the belt tension, the more pressure is exerted on the gripping teeth at the forward end of the splice. 4B manufacturers plastic, steel and stainless steel elevator buckets and cups for agricultural and industrial applications. 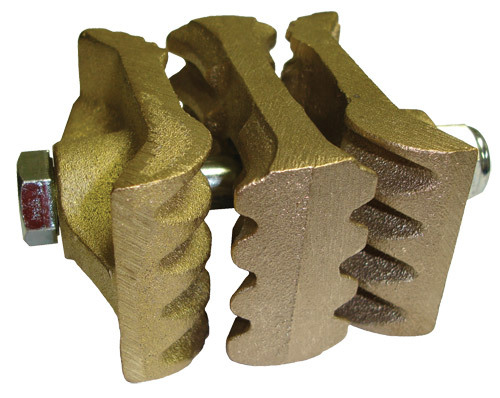 With over 400 different sizes and styles, 4B can supply the right product for your bucket elevator. At 4B we have designed hundreds of bucket elevators for many different industries from animal feed, grain storage and processing, flour milling, malting and brewing through to biomass, cement, coal, frac sand and other heavy industries. We can provide preliminary design information for upgrading your existing elevator or help with designing a new elevator. Take advantage of 4B’s FREE worldwide technical support from a team of engineers specializing in the design of bucket elevators. Using your key technical data, our engineers will provide the preliminary design and component details so that your elevator performs as expected and achieves required capacities and discharge characteristics.